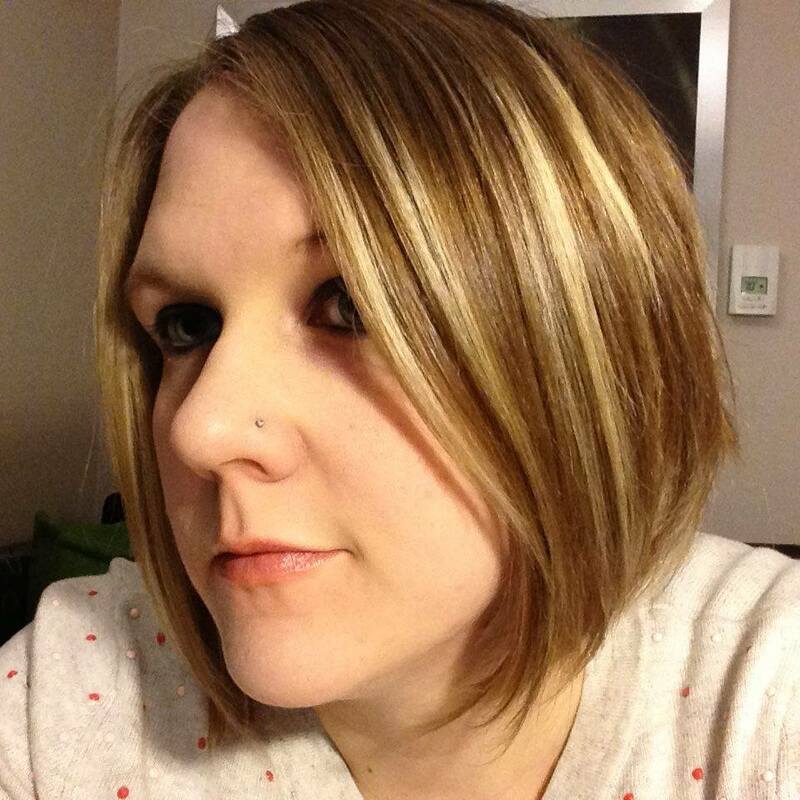 January 2, 2012 Anna P.
NOTICE: Since posting, the iSi Twist ‘n’ Sparkle product has been recalled in the U.S. and Canada for potential hazards while using. The manufacturer has warned users to stop using the product immediately. For more information, please visit twistnsparkle.com. I was able to get a refund for the products and accessories purchased, so it is a good idea to look into it if you are impacted, too! Here’s one of my Christmas presents from Steve: the iSi Twist ‘n’ Sparkle! The kit comes with a reusable BPA-free bottle, the carbonating “wand”, 3 “sparklets” carbonating cartridges, bottle cap, manual and recipe book. I can’t speak to the effectiveness of the Soda Stream because I’ve never used it, but what I like about the iSi so far is that it is extremely portable and easy to use. It doesn’t take up valuable space on the kitchen counter and it can easily be packed in the box it came in for neat storage. All you need to make a fresh bottle of sparkling water is the bottle, sparkling wand, one “sparklet” cartridge and water. 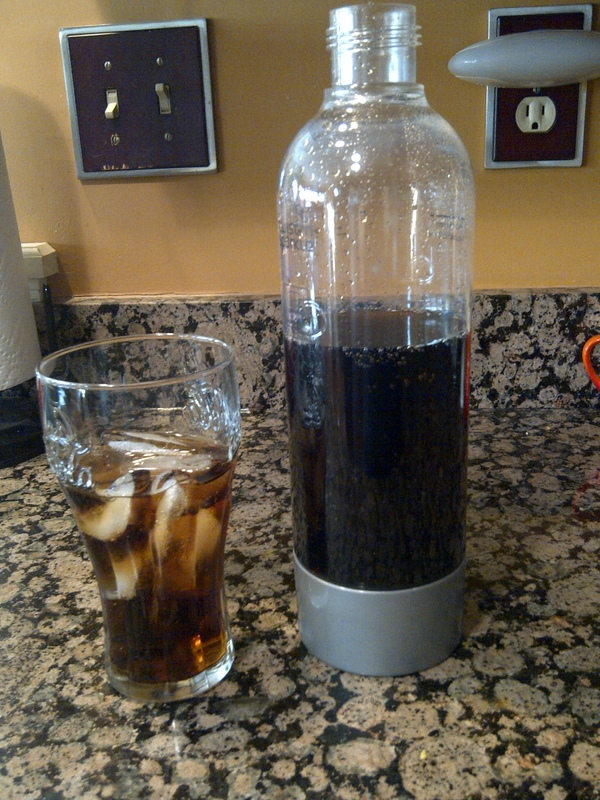 Fill the bottle with water, put the cartridge in the wand, twist onto the bottle, and let carbonate for a minute or two. You need a new cartridge each time, which can be considered a downside to this system. 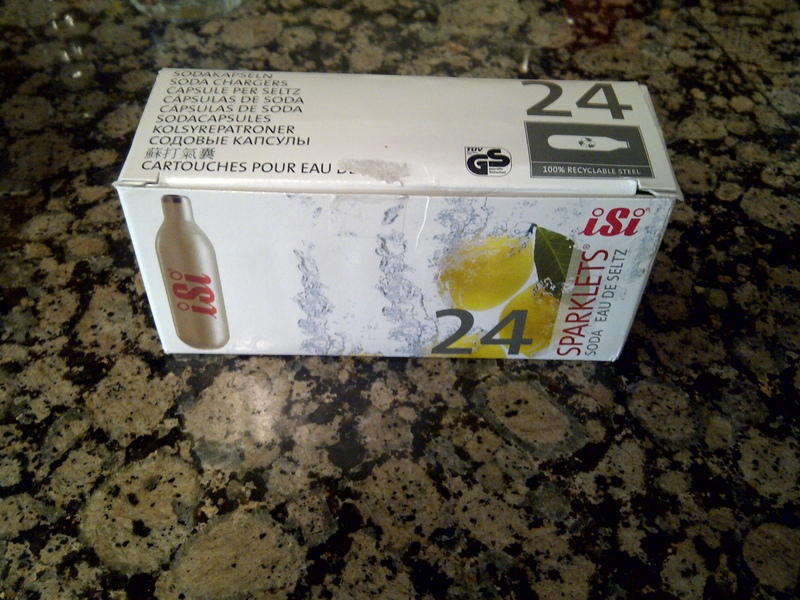 Extra “sparklets” are available in packs of 24, and I saw them for as little as $19.99 at Williams Sonoma and as much as $24.99 at Best Buy here in Pennsylvania. You can use soda syrups, such as those made by Soda Stream, with the iSi Twist ‘n’ Sparkle. 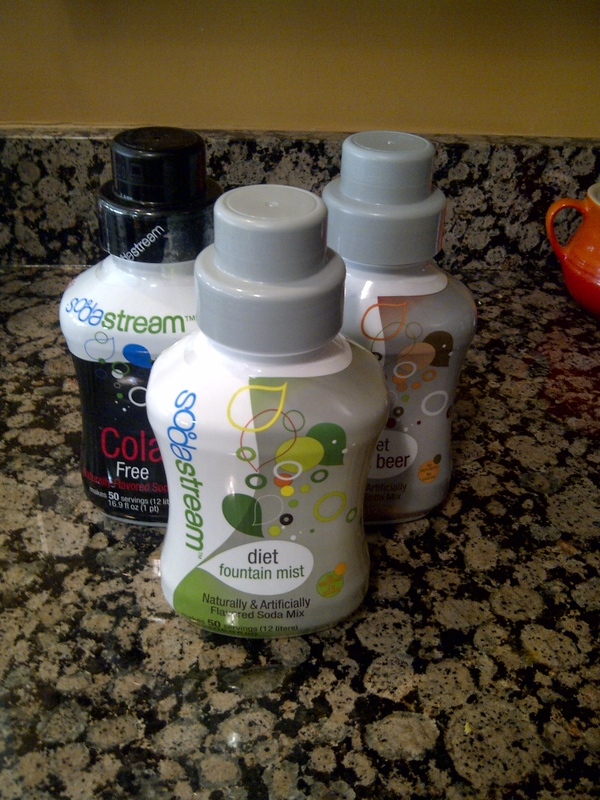 The Soda Stream syrups are highly concentrated and can last up to 3 months, since you only use about a capful at a time. 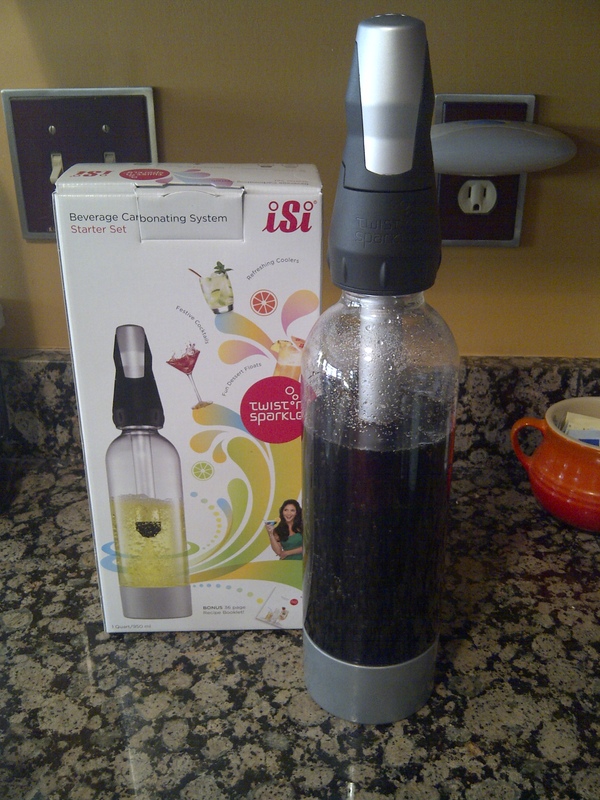 Soda Stream has several varieties available that you can get at Bed Bath and Beyond or Shoffee.com among other retailers. In addition to being portable, the iSi Twist ‘n’ Sparkle is also versatile. It can carbonate juice, tea, lemonade, wine and cocktails… and those were just the recommendations in the recipe book, so I am sure there are others. A glass of the diet root beer, served in a Coca-Cola glass. Ironically.